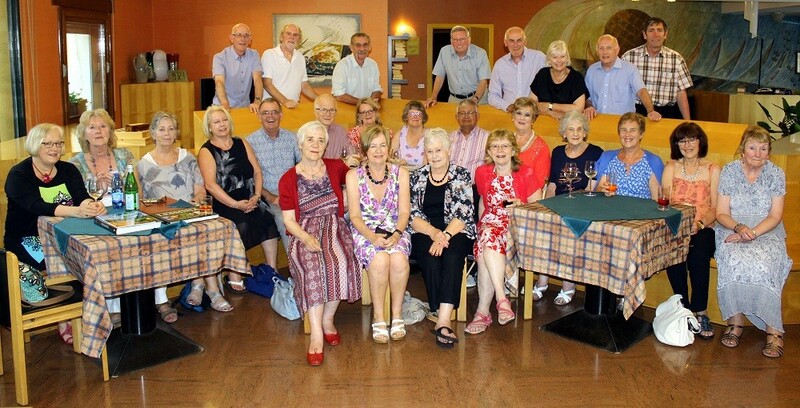 In early July, a mixed group consisting of members of the two Beeston U3A Wine Appreciation Groups and the Nottingham Wine Group set off for a week in the Valpolicella region of northern Italy led by Piers Krause. Our Ryanair flight from East Midlands was more or less on time and we were welcomed at Bergamo Airport with sunshine and temperatures well into the 30’s which is where they stayed for the rest of our visit. Our base was La Pergola, a friendly family-run hotel in Grezzana just north of Verona and Monica and her staff provided us with a level of hospitality it would be hard to match anywhere; comfortable accommodation, excellent food and wine. We visited three wineries during our stay (Santa Sofia, Tomassi and Serego Alighieri/Masi), all producing Valpolicella wines and allowing us to compare not only the products but their individual histories and philosophies. We learnt about the difference between Valpolicella Classico and “ordinary” Valpolicella; how Recioto is produced and how (and why) Amarone did not exist until after the 2nd World War and which in turn led to the development of Valpolicella Ripasso. The highlight was undoubtedly the visit to the estate of the Alighieri family, a wine family from medieval times and descendants of Dante, where Piers had persuaded Masi, the producers of their wines, to let us taste the famous Amarone Classico Riserva Costasera. But it wasn’t all wine. We also visited Verona, Padua and Venice and some of our group spent a night at the opera in Verona (a production of Aida which Roy described as “Cirque du Soleil meets Doctor Who”). Our final day was spent visiting Malcesine on Lake Garda before our final gala dinner at the hotel and some impromptu entertainment from Colin. We were a mixed bunch some of whom had not met before but the liveliness and friendly atmosphere evident from Day 1 made for a most convivial week. I must also make mention of our driver, Delfino, whose hard work and patience were much appreciated, especially when our timekeeping and Italian roadworks seemed about to thwart the schedule. Piers has finally decided to hang up his corkscrew and will sadly not be leading any more of these adventures (but he will of course continue to lead our monthly tastings) so it seems appropriate to record our appreciation of his efforts not only in organising this trip but all the previous ones as well. I’m sure that whoever takes on the mantle of tour leader will have a valuable source of knowledge and experience to call on. We have tasted and discussed a variety of wines in the past quarter. In October we compared Sauvignon Blanc, Pinot Noir and Shiraz/Syrah grapes of the New World and the Old World. The best from the New world was a New Zealand Pinot Noir, Coney Pizzicato 2014 from Majestic costing £14.99 (reduced from £19.99). This had the balance and elegance of a good Burgundy. On the whole we thought that the old world had the edge, showing more character and complexity. The best of the tasting was a Cotes du Rhone 2010 from the world famous Etienne Guigal. (£12.99 from Majestic). It had intense fruit, ripe tannins and good length and was a wine that we would be happy to offer our boss at a dinner party. We devoted ourselves to the wines of Spain in November. We tasted a good value white from Rias Baixas in North-West Spain made from the Albarino grape. (£8.50 The Wine Society). The quality of white wine from this area has greatly improved and is now getting popular. The best wine, by a long way, was a Rioja Reserva 2009 (£12.99). It is from the Majestic ‘Definition’ range of wines, which aims to “capture the quintessential qualities of the world’s greatest wine styles”. The palate was fruit packed, developing coffee and spices into the finish. The December tasting saw us celebrate the festive season. (See photo). We brought food to share and tasted some special wines, including a Grand Cru Chablis, a mature German Riesling, and a magnum of Moulin a Vent (a top Beaujolais Cru). The jury were split in choosing the best red wine. Some preferred the Burgundy, a 2009 Beaune (£27 from O W Loeb) and others the claret, a 2008 Haut Medoc from Chateau Senejac (£15 from the Co-op). Our group is fully subscribed and there are no vacancies at present. We are hoping to open a second Wine Group. If you wish to join this new Group, please tell Piers who will put your name on a list. In the early hours of a chilly May morning, while Nottingham slept, twenty five wine tasting enthusiasts left for a five day coach tour of Burgundy. Beeston U3A members, members of the Nottingham Wine Circle and the Nottingham Wine Group made up the party. Piers Krause was the essential link between these three groups. 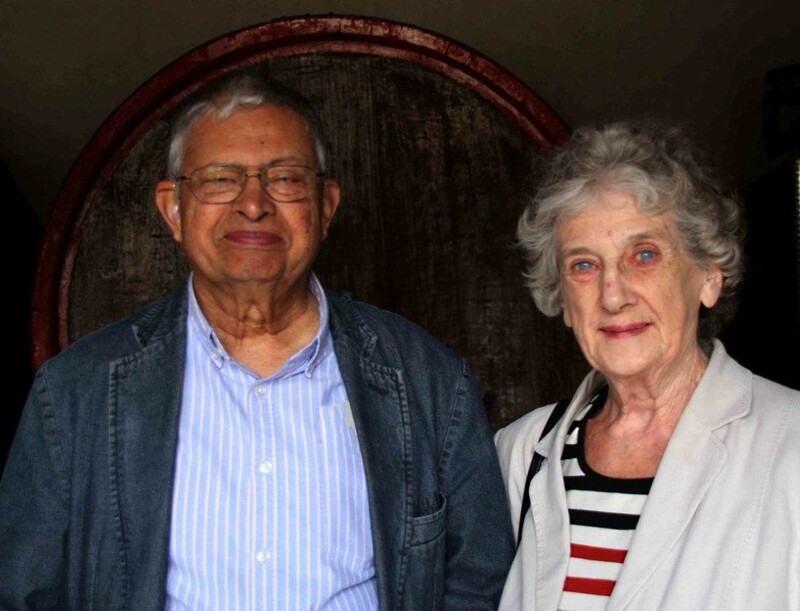 Piers, pictured above left, with his wife, is the wine tutor to the Beeston wine tasting group and, until recently was also tutor to the Nottingham wine group. This was to be the fifth European trip Piers had led. 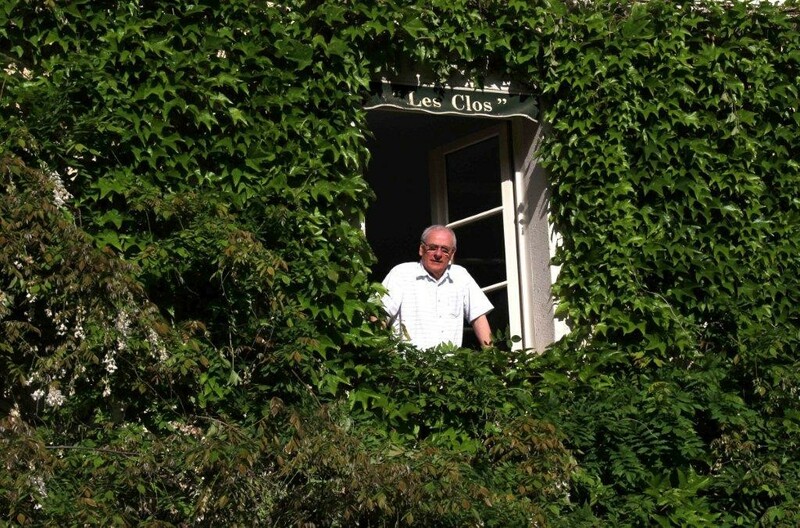 We travelled to the small town of Chablis to stay the night at Hostellerie des Clos. right, admiring the view! Chablis is about the size of Southwell, a prosperous town that has grown rich on its reputation for growing the Chardonnay grape on its Kimmeridgian clay-limestone in the production of Chablis wine. This was the third time the wine tasting group has stayed at this hotel. It boasts a one star Michelin restaurant providing superb food and an enormous range of fine wines. We arrived in the early evening and had dinner later. The rest of the evening went by in a blur of fine food and wine. The following morning we left for our first wine tasting at Louis Michel. This producer of Chablis has an international reputation as a leading producer of Chablis. We tasted five Chablis cuvees ranging in price between €15 and €50. Louis Michel makes all his wine using stainless steel tanks thus preserving the purity of the grape and retaining its minerality. Oak is not used even for their Grand Cru. A very satisfied group left Chablis and headed south to Chalon sur Saone just south of Dijon which was going to be our hotel base for the following three nights. The following day we set off in glorious sunshine, some of us even sported shorts and sun hats. The day was going to be dedicated to the tasting of Beaujolais and the Gamay grape. Our first visit was to Domaine Richard Rottiers. Richard gave us a very warm welcome, see picture left, and we all squeezed into a small barn like room. The floor was bare earth and in the light from the doorway we could just make out the oak barrels which lined the walls. This was a complete contrast to the high tech, modern visiting experience of Louis Michel. Here you could smell the yeast and experience the day to day process of wine making. His production is entirely organic. 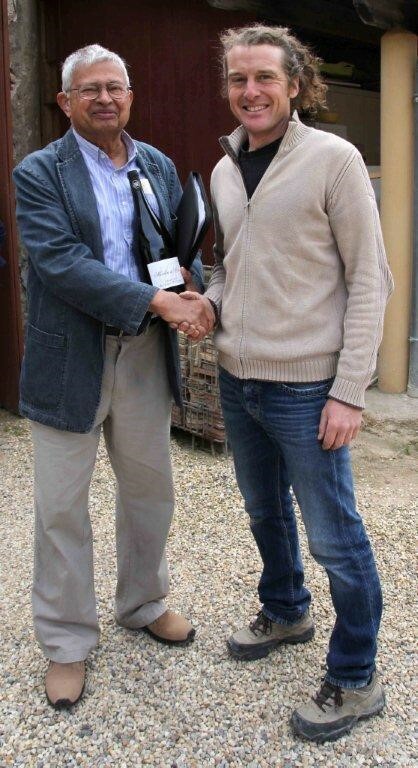 Richard specialised in producing Moulin-à- Vent which is the greatest of the ten Beaujolais Cru. Soil and climate produce the full bodied character of Moulin a Vent wines. We tasted both red and white Beaujolais Village, a Rosé and a sparkling Rosé. Once again we loaded the coach with more wine and set off for our second Beaujolais tasting. I was designated “Trolley Pusher”! After a stop for lunch we arrived at Chateau Thivin. Piers is pictured below with one of the Thivin family. We were now in southern Beaujolais. Once again we were visiting a relatively small producer working around the slopes of the Côte de Brouilly. We tasted six cuvees of Beaujolais and were also shown how the wines were produced. The Thivin family have produced wines for generations. They produce wines from a very reasonable £4.50 to £14 for their top cuvée. Our final day of wine tasting took us to Beaune, the wine capital of Burgundy, and the medieval cellars of Remoissenet built under the ancient city walls. Remoissenet are negociants (wine traders). 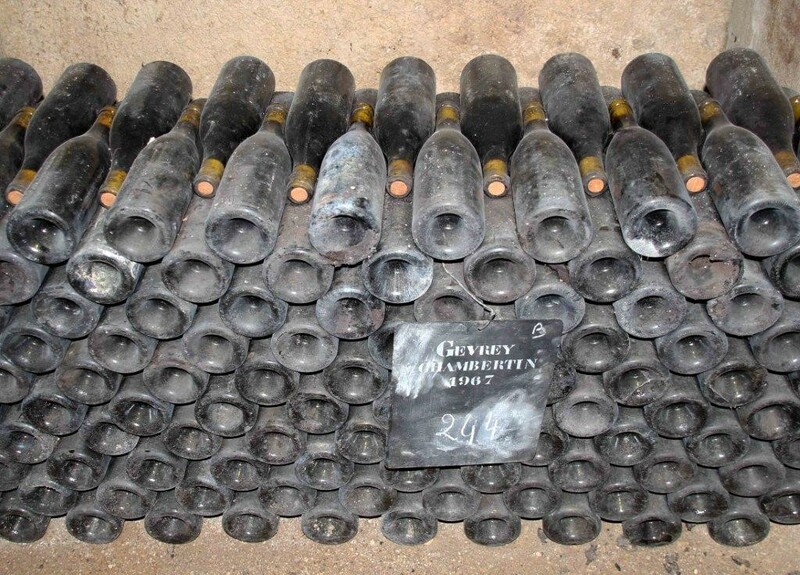 Although they own some vineyards most of the wine they produce is purchased as grapes from local vineyards and produce both white and red burgundy wine from the Chardonnay and the Pinot Noir grape. We tasted three white and six red wines most of premier cru quality. The highlights were a Meursault, a Beaune Marconnets and a Premier Cru Gevrey Chambertin. These were wines that many of us would never have been able to afford but gave us the opportunity of tasting wine of the very highest quality. After the tasting we were able to visit Remoissenet’s extensive cellars and their 360,000 bottles of wine some dating back to the 1950’s. One of the benefits of visiting wine producers and vineyards by coach is that we can taste their wine and not worry about having to drive! 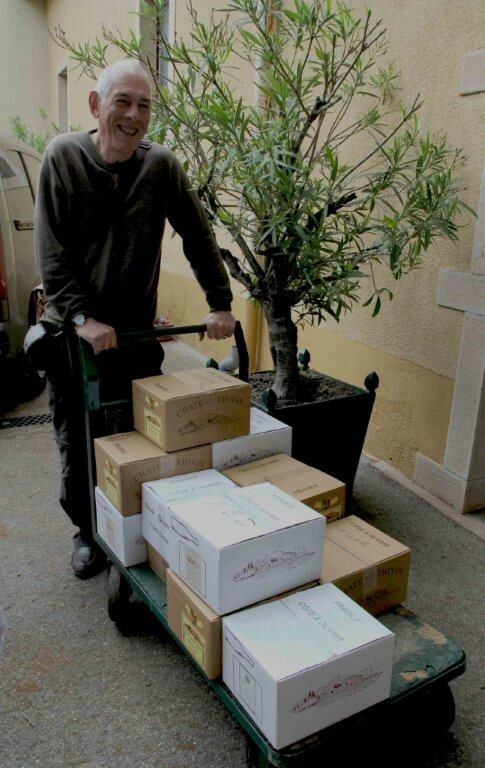 There is also the added advantage of being able to purchase cases of wine and load it onto the coach not worrying that we would run out of space! 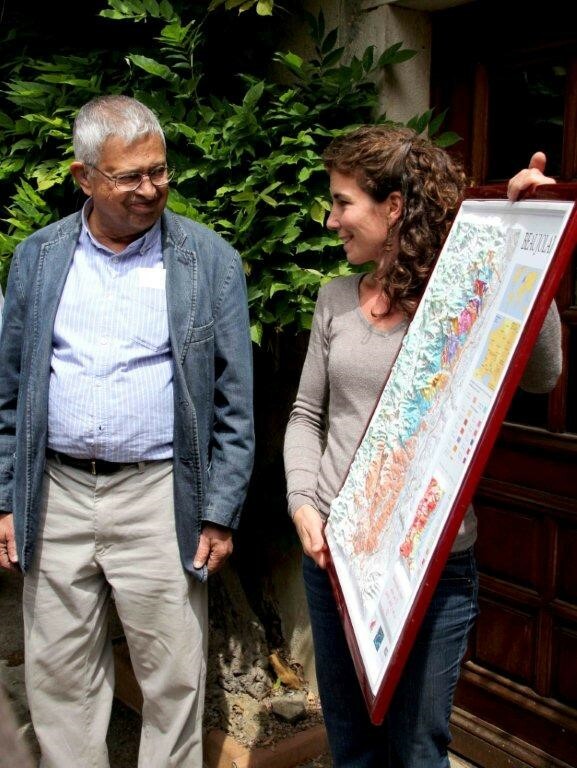 We owe a huge debt of gratitude to Piers who had used his contacts to introduce us to wine growers of high quality. 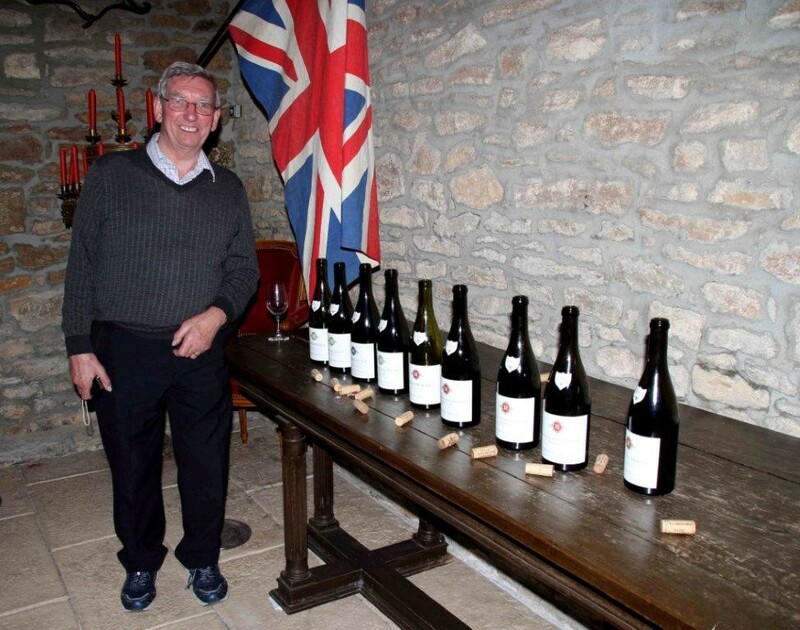 We also benefitted from Piers’ extensive knowledge of the wines of Burgundy. I especially appreciated visiting three such different producers; glittery Louis Michel and his stellar Chablis, Rottiers’ tiny organic set up which warmed our hearts and in between a visit to Thivin in a picture postcard setting. The experience was seamless. As a postscript for those with an interest in bird watching we saw around 40 different species of birds during our travels through France. Peter Sadler, a member of our group and also Group leader of the Beeston U3A Birdwatching group helped some of us identify Black Redstart, Serin, Night Heron, Hoopoe and possible Montagues Harrier, birds very rarely seen in the UK. You will notice that the name of our group has changed. I would like our group to be called ‘Wine Appreciation’ and not ‘Wine Tasting’ as we do much more than taste wine; for example we discuss the wine benefits of different climates and the contribution that geology makes to wine. During the last quarter we have travelled the vinous world. In September we tasted and discussed the wines of South America, including Argentina, Chile and Uruguay. We thought the best wine was a Chilean Merlot made by Concha Y Toro. The wines were from Majestic and the Wine Society. We visited the French regions in October. One of the wines we had was a Saint Chinian from the Languedoc and it was a coincidence that a couple from our Group sent me their apologies as they were holidaying at their cottage close to their favourite village of St Chinian. The best wine at this tasting was a Bordeaux Graves -Chateau Gales – from the Beeston branch of Lidl! Finally we had an all Australian tasting from wines supplied by Sainsbury and Tesco. A shiraz from Tim Adams (Tesco) stood out. It was aromatic with rich blackberry fruit and soft tannins. This group has grown to such an extent that we are fully subscribed now. This group has grown to such an extent that we are fully subscribed now. We have to limit the numbers because we wish to taste more than a thimble full of wine! Those wishing to join will go on a waiting list. During the past quarter we have grown to such an extent that we are fully subscribed now. We have to limit the numbers because we wish to taste more than a thimble full of wine! Those wishing to join will go on a waiting list. We tasted Chilean wines in March. We liked the Malbec/Cabernet from Montes but the wine that stood out was the Casa Lapostelle Cuvee Alexandre Merlot which was fruity and complex. Both are available at Majestic Wine. We had Italian wines from the Wine Society in April and we found that the Valpollicella Ripasso Superiore from Torre del Falasco had immediate appeal as it was richly flavoured. The wine for serious lovers was Fontodi’s Chianti Classico which, though young, showed lots of potential because of its complexity and balance. In May we tasted Argentinian wines for the first time in our Group. The runaway winner was Nicolas Catena’s Malbec. This is a gorgeous and classy wine well defined with its tight fine tannins and acidity. It is available at the Nottingham branch of Majestic. We meet at 2pm on the first Tuesday of every month at the White Lion, Beeston and have themed wine tastings covering most wine growing areas in the world. We taste and discuss the wines. There are vacancies and you are welcome to join. Please send me an email. My address is pierskrause@yahoo.co.uk Cost is usually around £5 per person for the wine plus £1.50 towards room hire expenses. We tasted French wines at our January tasting. The most interesting wine was a Roussillon made by an Englishman Jonathan Treloar. This wine is available from a local wine merchant. The theme for the February tasting was the wines of Australia. Our group was split as to which was the best wine. Some of us thought it was a Cabernet Sauvignon, Kangarilla Road from Maclaren Vale, whilst others liked the Barossa Valley Shiraz from Peter Lehmann the best. These wines were bought from Majestic Wine Warehouse. At our March gathering we tasted Chilean wines and we will be sampling the wines of Italy on 1st April. We have room for new members. Do come along and give it a trial. If you are attending for the first time please send an email to pierskrause@yahoo.co.uk Cost is usually around £5 per person for the wine plus £1.50 towards room hire expenses. We are a friendly group and meet at 2 pm on the first Tuesday of the month at The White Lion, Beeston and have themed wine tastings covering most wine areas of the world. Places are available and you are welcome to join.